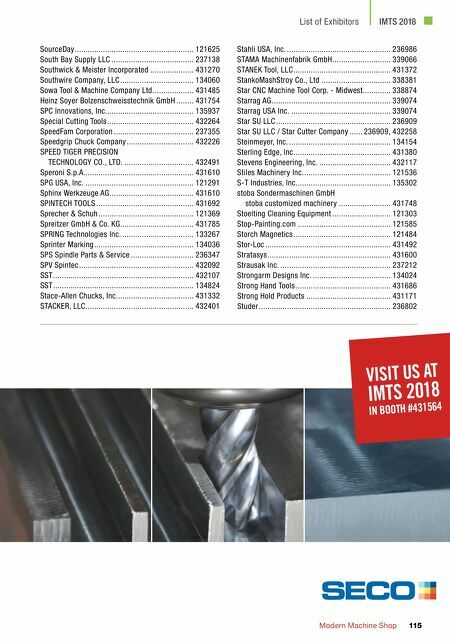 MMS AUGUST 2018 114 mmsonline.com IMTS 2018 List of Exhibitors Shoptech Software Corporation ......................... 133252 Shore Auto Rubber Exports Pvt. Ltd. .................. 121721 Shutonlpiranga ................................................ 121471 Shuttleworth Inc. a division of ProMach ............. 121157 SHW Werkzeugmaschinen GmbH ....................... 338966 Siboni srl ......................................................... 135078 SIC MARKING USA, INC. .................................... 236438 Siemens PLM Software, Inc. ................ 134500, 215012 Siemens Industry Inc. ............ 134500, 134502, 215004 Sify Technologies North America Corp. eLearning & digital learning technologies ...... 237182 Sigma CNC ...................................................... 338336 SigmaTEK Systems, LLC ................................... 133137 SIKO Products, Inc. ........................................... 134245 Silvent North America, Inc................................. 121217 Silverstar Manufacturing Co., Ltd. ..................... 121745 SIMATEC.......................................................... 237223 Sinfonia Technology Co., Ltd. ............................ 236890 (Sino-USA) Dafeng Lida Compressed Air Systems Co., Ltd. ......................................... 121930 SINTER SUD SPA .............................................. 431251 Sisu ................................................................ 236477 Six Star Machinery Industry Co., Ltd. ................. 134148 SKM Industries, Inc. ......................................... 121569 Sky Hook / Syclone ATTCO Service .................... 121572 Slater Tools Inc. ............................................... 432139 SLE Technology GmbH ...................................... 431742 SLM Solutions NA, Inc. ..................................... 432304 S.L. Munson & Company................................... 237240 SMAC Moving Coil Actuators ............................. 121368 Smalley ........................................................... 236300 Smartforce Learning Lab .................................. 215618 SMC Corporation of America ............................. 121238 SME ................................................... 215621, 339400 SMEC Co., Ltd. ................................................. 338986 Smith Corona Labels & Ribbons ........................ 121316 Smith Metal Products ....................................... 236313 SMW AUTOBLOK CORPORATION ........................ 431700 Sodick, Inc. ...................................................... 134802 Solar Manufacturing ......................................... 236341 Solid (Beijing) Technology Co., Ltd. .................... 121078 SolidCAM, Inc. ................................................. 134523 SolidProfessor ................................................. 236485 Solutions Theater - HANNOVER MESSE USA ................... 121847, 134001 SolutionWare Corporation ................................. 133159 Sonicor Inc. ..................................................... 121328 Sonmez Trasnformator Sanayi ve Ticaret A.S. ..... 135190 Soph Magnetics, Inc. ........................................ 432184 SORALUCE ....................................................... 339453 SORALUCE America, Inc. ................................... 339453 Sotek Technology Co., Ltd. ................................ 236682 DOUBLE YOUR METAL REMOVAL RATE Looking to reduce your cycle times? 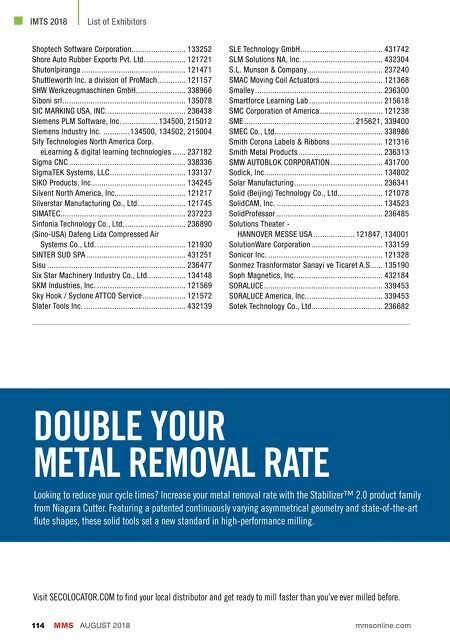 Increase your metal removal rate with the Stabilizer™ 2.0 product family from Niagara Cutter. Featuring a patented continuously varying asymmetrical geometry and state-of-the-art flute shapes, these solid tools set a new standard in high-performance milling. Visit SECOLOCATOR.COM to find your local distributor and get ready to mill faster than you've ever milled before.